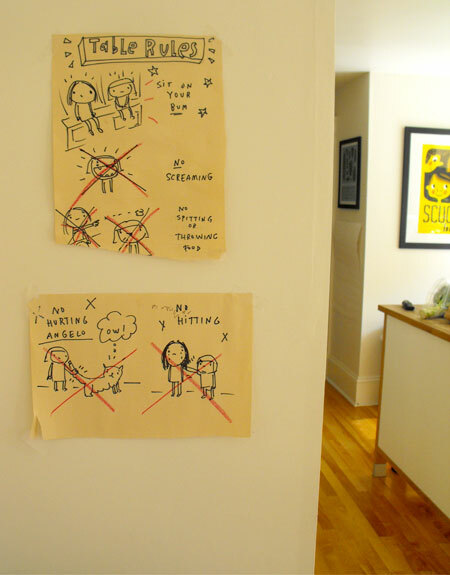 Our “Table Rules” poster has worked wonders around here. Especially for the smallest person in our house, who you can see, was my major inspiration for the poster. I whipped it up in a fit of desperation one night before supper. Nothing else was working or getting through to my temperamental little 2 year old. Every night she was making dinnertime stressful with her crazy behavior, I couldn’t take it anymore. I’m not sure why I haven’t made anything like this sooner… maybe because it just seemed too easy. If your kids aren’t listening to you when you ask them something 100x why would a picture work? Well, it does. 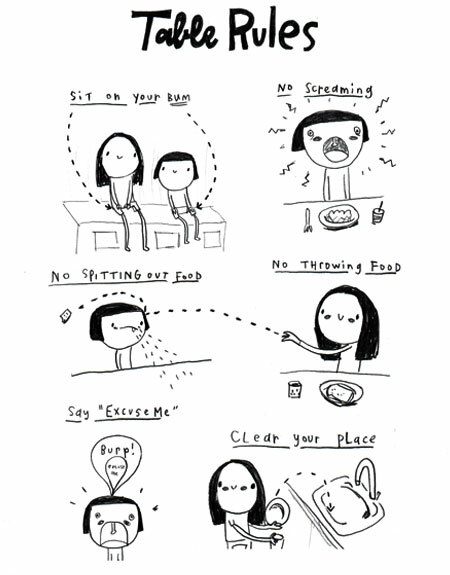 When someone is breaking one of our “rules” at dinner time, we simply point to the picture and (mostly) they stop. It’s also been a big conversation piece with visitors to our home (most likely thinking to themselves “what kind of crazy house is this?!”). People seem to like it …so I thought if this helped us, maybe it might help some others in the same situation. So I redid the poster and made it into a PDF (b+w, so your kids can colour it in if they want). You can download it by clicking on the button below. P.S Sosi is pretty horrified I drew her throwing food and wanted me to make it very clear she doesn’t do that. I just couldn’t draw Ila doing everything . Ha ha! Great poster, but the original is hilarious. You can sense the frustration in those big red ‘X’s. mia: 🙂 ha, yes, much frustration in those Xs! oh man – I love this! I can’t wait to see what my three kids do with this. I’ll bet they come up with some of their own! Thankyou so much! I love this! Hopefully this will help me with my own unruly 3 year old! Brilliant!!! I am totally going to try this! I’ve done the picture-gram for snack choices and to give my kids reminders of the things they like to play – I refer them to it when the dreaded “Mommy, what can I DO?? ?” question gets hurled at me. I originally read “No Hitting” as “No Knitting.” I considered this a perfectly reasonable dinner table rule. Wow, what a great idea! We are having minor dinner table behaviour issues at the moment which only get worse with confrontation, so perhaps pointing at a sign will be an improvement. Although after tonight’s dinner behaviour we really need a ‘No noises like a possessed child a la The Exorcist’ picture. -no wild howling when the answer is no, etc. thanks barbara, what a great idea! Fantastic table rules! I love sit on your bum, my Skyla dances around at the table and is never still! I have to tell you that I printed this out and put it up next to our dinner table…worked wonders! Thanks! thanks for this Lori. Jivan and Ani love it and they refer to it each time they sit at the table to eat! very cute and it is thanks to you!